Better Post Views plugin counts post views; what’s the beneficial of counting post views? 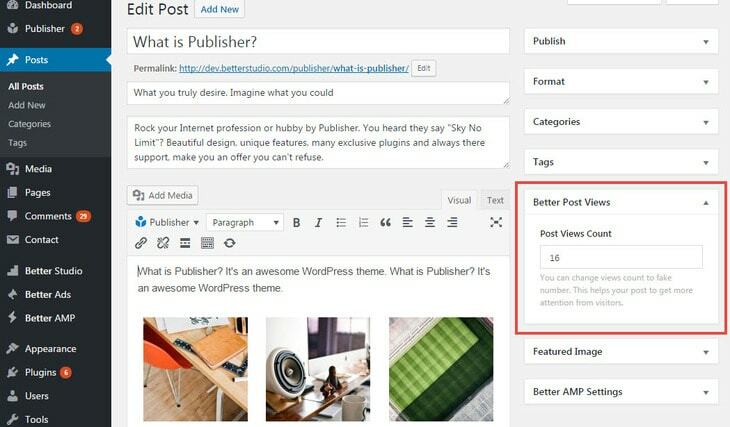 Number of post views can be shown in content blocks, widgets, post page and also in WordPress admin area (all posts page). Better Post Views can track number of views in daily or weekly basis, then uses this number for displaying popular posts in content blocks or widgets. To find these options go to Better Studio → Post Views. 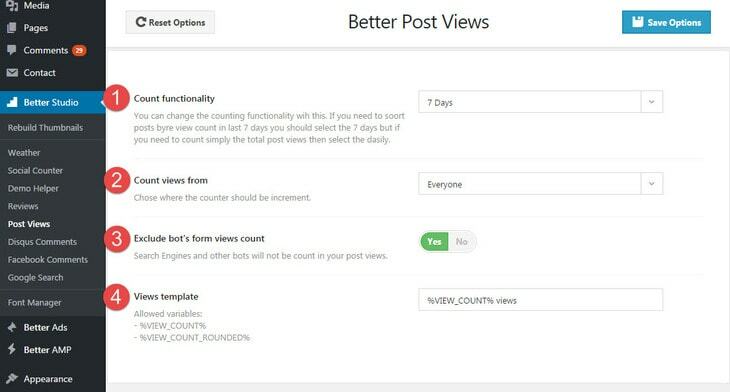 If you need to sort posts by counting views in last 7 days, select the “7 days” but if you need to count simply the total post views, then select the daily. Remember this option is for selecting popular posts not for displaying number of post views. 3- Exclude bot’s form views count: Search Engines and other bots will not be counted in post views. 4- Views Template: Select how views count displays in WordPress admin area. First one uses all time post views and the last one uses last 7 days views. Widgets of Publisher content blocks are the same and has Order By option under Posts Filter. Read more about adding widget to sidebar. You can change posts views for every single post manually. For this purpose edit the post, find Better Post Views in sidebar. Now change Post Views Count to whatever you want. It’s a so cool feature in Publisher; you can select how post views number and icon look like for different number of post views. For example you can show views under 500 by yellow color and a weak fire flame icon and display views above 500 by red color and the icon burst into flames! If you want to see how it looks like, visit Publisher demo website and you see how different post views look different. 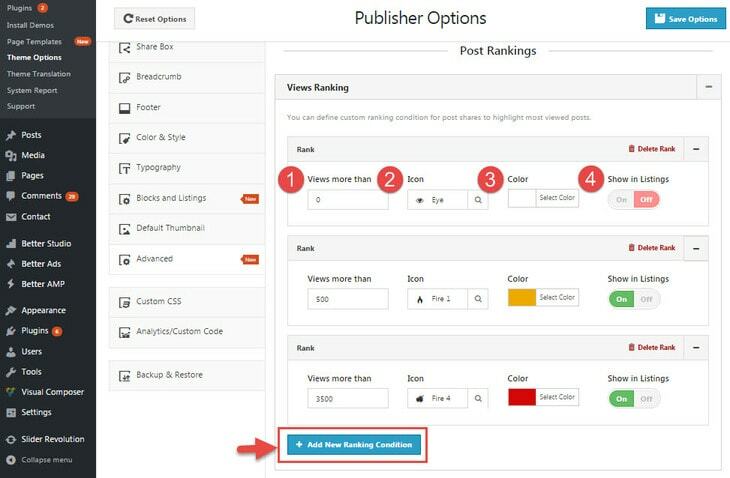 To customize Views Ranking go to Publisher → Theme Options → Advanced → Posts Ranking → Views Ranking. You see a button + Add New Ranking Condition, click on it and add conditions as many as you want. 1- Views More Than: This ranking style just applies to posts with views more than this number. 2- Icon: Select an icon between hundreds of Font Awesome icons for this ranking. 3- Color: Select a color for this ranking. 4- Show in Listings: Simply hide number of views in content blocks and widgets for posts which fall in this ranking. As an example in above image, views less than 500 will be hidden, between 500-3500 have yellow “Fire 1” icon and views more than 3500 views have red “Fire 4” icon.